Parkinson's disease (PD) is the most common movement disorder. While neuronal deposition of α-synuclein serves as a pathological hallmark of PD and Dementia with Lewy Bodies, α-synuclein-positive protein aggregates are also present in astrocytes. The pathological consequence of astrocytic accumulation of α-synuclein, however, is unclear. Here we show that PD-related A53T mutant α-synuclein, when selectively expressed in astrocytes, induced rapidly progressed paralysis in mice. Increasing accumulation of α-synuclein aggregates was found in presymptomatic and symptomatic mouse brains and correlated with the expansion of reactive astrogliosis. The normal function of astrocytes was compromised as evidenced by cerebral microhemorrhage and down-regulation of astrocytic glutamate transporters, which also led to increased inflammatory responses and microglial activation. Interestingly, the activation of microglia was mainly detected in the midbrain, brainstem and spinal cord, where a significant loss of dopaminergic and motor neurons was observed. Consistent with the activation of microglia, the expression level of cyclooxygenase 1 (COX-1) was significantly up-regulated in the brain of symptomatic mice and in cultured microglia treated with conditioned medium derived from astrocytes over-expressing A53T α-synuclein. Consequently, the suppression of COX-1 activities extended the survival of mutant mice, suggesting that excess inflammatory responses elicited by reactive astrocytes may contribute to the degeneration of neurons. Our findings demonstrate a critical involvement of astrocytic α-synuclein in initiating the non-cell autonomous killing of neurons, suggesting the viability of reactive astrocytes and microglia as potential therapeutic targets for PD and other neurodegenerative diseases. α-synuclein (α-syn) is a major component of Lewy bodies (LB) and Lewy neurites (LN) appearing in the postmortem brain of Parkinson's disease (PD) and other synucleinopathies [1, 2]. Genetic mutations in α-syn, including point mutations (A53T, A30P and E46K) and multiplications have been linked to familial PD and Dementia with LB [3–7]. Although the precise function of α-syn remains elusive, overwhelming evidence indicates that malfunction of α-syn, especially the aggregation of misfolded α-syn, plays an important role in the process of neurodegeneration [5, 8]. Neuronal expression of either human wild-type or PD-related mutant α-syn induces neurodegeneration associated with pathological accumulations of α-syn and reactive astrogliosis [9–13]. In addition, α-syn-containing inclusion bodies are present in oligodendrocytes of multiple system atrophy (MSA) . Transgenic mice over-expressing wild-type α-syn in oligodendrocytes display severe neurological alterations and neurodegeneration [15, 16]. Previous studies also reveal that α-syn-containing inclusion bodies present in astrocytes of sporadic PD [17–19] and over-expression of wild-type or C-terminally truncated α-syn in U373 astrocytoma cells induces apoptotic death of astroglial cells . However, whether the astrocytic expression of PD-related A53T α-syn contributes to neurodegeneration is unknown . Here we generated a new line of α-syn inducible transgenic mice in which the PD-related A53T α-syn was selectively expressed by astrocytes. Interestingly, the mutant mice developed rapidly progressed paralysis, likely resulting from widespread astrocytosis, severe microglial activation, and especially midbrain dopaminergic and spinal cord motor neuron degeneration. 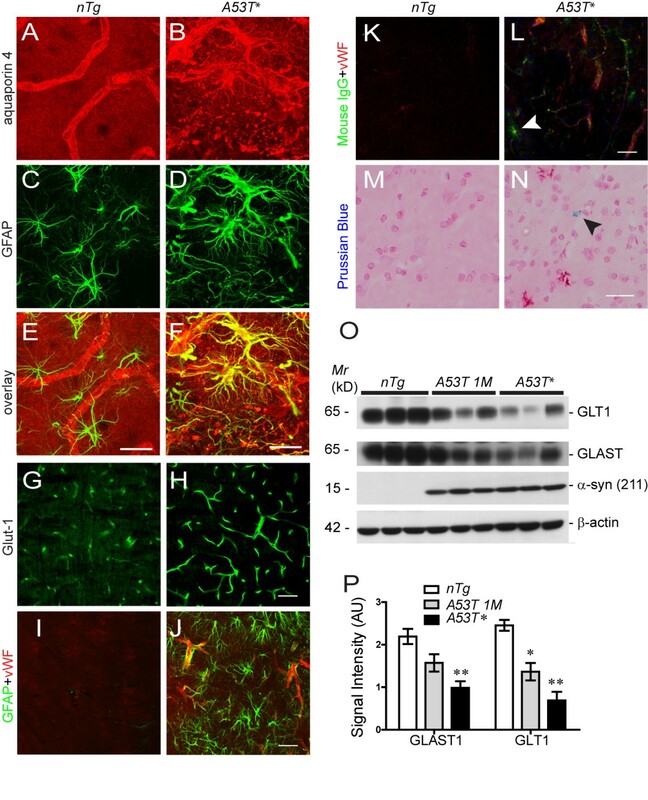 These results demonstrate that α-syn-mediated cytotoxicity to astrocytes is critical for inducing the non-cell autonomous degeneration of neurons, suggesting that the maintenance of normal function of astrocytes is important in ameliorating the progression of neurodegeneration in PD and other neurodegenerative diseases. α-syn is most abundant in neurons . 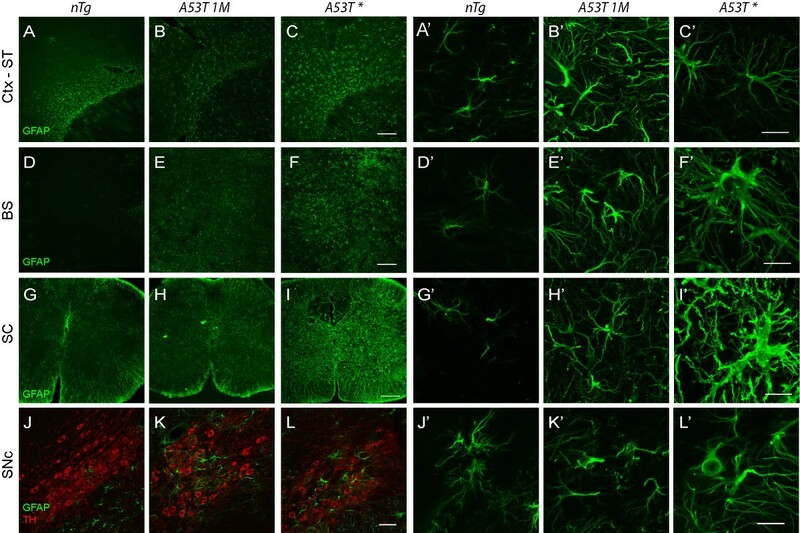 However, the expression of α-syn in astrocytes has not been rigorously examined. Here we prepared the astrocytic and neuronal cell cultures from postnatal day 1 pups and compared the expression of α-syn in these cells. Consistent with previous findings , α-syn was highly expressed in neuronal cultures (Fig. 1A). Interestingly, a lower level expression of α-syn was consistently detected in astrocytes (Fig. 1A). Astrocytic expression of human α-synuclein in mice. (A). Western blot analysis of endogenous α-syn expression in primary cultured cortical neurons and astrocytes. Protein extracts (8 μg) from cultured cortical neurons and astrocytes were immunoblotted using antibodies against human/mouse α-syn (C20), β III-tubulin (neuronal marker), and GFAP (astrocyte maker). β-actin serves as the loading control. (B) A schematic outline of the "tet-off" system for astrocytic expression of α-syn in mice. The tetracycline operator-controlled human α-syn responder mice (tetO-α-syn) were crossed with GFAP-tTA activator mice to generate GFAP-tTA/tetO-α-syn double transgenic (A53T) mice, which selectively expressed exogenous human α-syn in astrocytes. (C) Western blot analysis of human α-syn expression in transgenic mice. One wild-type (WT) and two A53T lines (A8 and E2) of transgenic mice were obtained. The expression of exogenous human α-syn was detected by a human α-syn-specific antibody, α-syn (211). (D) The expression pattern of human α-syn in the brain of A53T (E2 line) transgenic mice revealed by Western blot using both human-specific and human/mouse α-syn antibodies. BS: brainstem, OB: olfactory bulb, Ctx: cortex, ST: striatum, Hip: hippocampus, MB: midbrain, CB: cerebellum; SC: spinal cord. (E-H) Representative images show human α-syn (red) and GFAP (green) co-staining in the striatum of A53T mice. The α-syn immunoreactivity is restricted to GFAP-expressing astrocytes. Scale bar: 20 μm. To reveal the potential contribution of astrocytic expression of α-syn in the pathogenesis of PD, we generated new lines of α-syn inducible transgenic mice that selectively expressed the human wild-type (WT) or PD-related A53T α-syn in astrocytes. As outlined in Fig. 1B, we crossbred the human glial fibrillary acidic protein (GFAP) promoter-controlled tetracycline transactivator (GFAP-tTA) transgenic mice  with the tetracycline operator (tetO)-regulated α-syn transgenic mice (tetO-WT or tetO-A53T) to generate the GFAP-tTA/tetO-WT (WT) and GFAP-tTA/tetO-A53T double transgenic (A53T) mice. The expression of exogenous α-syn in the double transgenic mice was demonstrated by Western blot using an antibody specifically against human α-syn. We have obtained one WT and two A53T lines of transgenic mice (Fig. 1C). Since most of studies focused on the A53T-E2 line, we refer this line as A53T mice in later description. The A53T transgenic mice displayed significant elevation of α-syn expression throughout the CNS, including olfactory bulb, cerebral cortex, striatum, midbrain, hippocampus, cerebellum, brainstem and spinal cord (Fig. 1D). Using an α-syn antibody that recognizes both mouse and human α-syn, Western blot analysis revealed about 10-fold increase of α-syn expression in the brain of A53T mice as compared to non-transgenic (nTg) littermate controls (see Additional file 1A). Moreover, at the cellular level, the expression of A53T α-syn was restricted to GFAP-positive astrocytes as demonstrated by co-staining of human α-syn with GFAP but not other cell type markers in the brain sections of A53T mice (Figs. 1E-H; Additional file 1B-D). To investigate whether over-expression of A53T α-syn in astrocytes caused any behavioral abnormalities, we monitored the body weight and examined the spontaneous locomotor activities and motor coordination of A53T mice. The A53T mice were viable but appeared smaller and weighted significantly less compared to age-matched nTg, as well as GFAP-tTA and tetO-A53T single transgenic mice at one and two months of age (see Additional file 2A-B). The spontaneous locomotor activities of A53T mice measured by the Open-field test were progressively declined from one month to two months of age compared to control mice (Fig. 2A; Additional file 2C-D). The grip strength of A53T mice was also significantly reduced in both fore and hind limbs at two months of age (Fig. 2B). The motor coordination of two-month old A53T mice seemed, however, not affected in the Rotarod test (see Additional file 2E). After two and a half months of age, the progression of movement disability of A53T mice was greatly accelerated. One of the four limbs paralyzed with the average age of onset at 71.6 ± 2.0 days (Fig. 2C, Additional files 3, Additional file 4). The paralysis quickly spread to the remaining limbs, and the affected mice experienced difficulties in eating and drinking after showing paralysis in two or more limbs. As a result, the body weight of symptomatic mice continued to drop during the disease progression (see Additional file 2F), and eventually, the animals died with the average lifespan at 90.4 ± 2.9 days (Fig. 2D, Additional file 5). The penetrance of paralysis was 100% in A53T mice. Early-onset neurological dysfunction and shortened lifespan of A53T mice. (A) Open-field tests reveal a significant decline of spontaneous ambulatory activities in A53T mice as compared to littermate controls at 1 and 2 months of age. **p < 0.01, ***p < 0.001. (B) Both fore and hind limb grip strength of A53T mice are impaired compared to littermate controls at 2 months of age. *p < 0.05, **p < 0.01. (C) Line graph reveals the onset of paralysis observed in A53T mice (n = 20). The average age of onset was 71.6 ± 2.0 days. (D) Line graph depicts the survival rate of A53T mice (n = 7). The average lifespan of the A53T mice was 90.4 ± 2.9 days. Previous studies also indicated that GFAP is expressed in neuronal precursor cells during development [24, 25]. 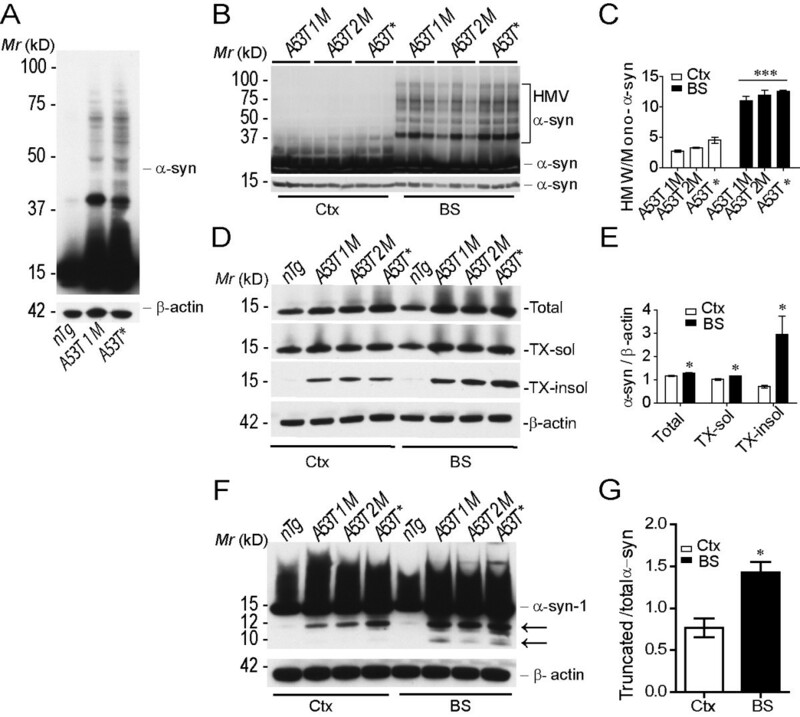 To assess the impact of developmental expression of A53T α-syn on the neurological dysfunction, a cohort of A53T mice were administered with doxycycline (DOX), a tetracycline derivative, to block the expression of A53T α-syn from embryonic stages to postnatal day 21 (P21). The DOX-exposed A53T mice behaved normally at one and two months of age (see Additional file 6). However, two months after removal of DOX, 43% of these mice started to lose body weight and displayed less spontaneous locomotor activities (see Additional file 6). All of these DOX-treated A53T mice eventually progressed to complete paralysis with an average age of onset at 102.1 ± 2.8 days and average lifespan at 110.0 ± 3.8 days. These data suggest that the paralysis developed by A53T mice is not dependent on the developmental expression of A53T α-syn. To reveal the cause of neurological dysfunction, we checked whether A53T α-syn affected astrocytes in the brain. Brain sections of both asymptomatic (A53T 1M) and symptomatic mice (A53T*) were examined for GFAP staining (Fig. 3). The number of GFAP-positive astrocytes was dramatically increased in the gray matter of cerebral cortex (Figs. 3B-C), striatum (Figs. 3B-C), brainstem (Figs. 3E-F), spinal cord (Figs. 3H-I), midbrain (Figs. 3K-L), and other brain areas of A53T mice as compared to age-matched nTg mice (Figs. 3A, D, G and 3J). The increase of GFAP expression was also confirmed by quantitative RT-PCR and Western blot analyses in which the level of GFAP expression was further elevated in the symptomatic mice (see Additional file 7). Moreover, the soma size of GFAP-positive astrocytes was also significantly increased in the brainstem, spinal cord, and midbrain of symptomatic A53T mice (nTg, 27.8 ± 5.7 μm2; A53T*, 132.0 ± 34.9 μm2; p = 0.0051) (Figs. 3A'-C', D'-F', G'-I' and 3J'-L'). Taken together, these results demonstrate that exogenous expression of human A53T α-syn in astrocytes induced severe astrogliosis in mice. More GFAP-enriched and hypertrophic astrocytes in A53T mice. (A-L') Representative images show GFAP staining (green) in the cerebral cortex-striatum (A-C'), brainstem (D-F'), spinal cord (G-I'), and substantia nigra pars compacta (SNpc) (J-L') of nTg mice (2.5-month old) and A53T mice at asymptomatic (1-month old, A53T 1M) and symptomatic (A53T*) stages. Hypertrophy of astrocytes is shown in the brainstem (F'), spinal cord (I'), and SNpc (L') of symptomatic A53T mice. The SNpc dopaminergic neurons were revealed by tyrosine hydroxylase (TH) staining (J-L, red). Scale bar: 200 μm (A-C, D-F, G-I), 50 μm (J-L), and 20 μm (A'-C', D'-F', G'-I', J'-L'). Astrocyte plays an important role in maintenance the homeostasis of extracellular environment of neurons . The processes of astrocyte end-feet encircle the endothelial cell of blood vessels for maintenance of blood-brain barrier (BBB) and withdrawal of nutrients from the blood [27, 28]. The astrocyte-endothelial cell interaction plays a major role in regulating brain water and electrolyte metabolism under both normal and pathological conditions . In search for the signs of BBB damage in the brain of symptomatic A53T mice, we examined the expression and subcellular distribution of aquaporin 4, glucose transporter 1 (Glut1) and von Willebrand factor (vWF) in astrocyte and vascular endothelial cells. As shown in the brainstem of nTg mice, aquaporin 4 was normally confined to the end-foot of astrocytes that outlined the blood vessels in the brain (Figs. 4A, C and 4E). In the brainstem and spinal cord of symptomatic A53T mice; however, aquaporin 4 was redistributed to the soma and proximal processes of astrocytes (Figs. 4B, D and 4F). The redistribution of aquaporin 4 to the soma of astrocyte has been shown before to impair the shielding of end-foot around blood vessels . In addition, abnormal accumulation of Glut1 and vWF in the vascular endothelial cell was observed at the brainstem and spinal cord of symptomatic A53T mice (Figs. 4G-J), indicating the dysfunction of vascular endothelial cells. 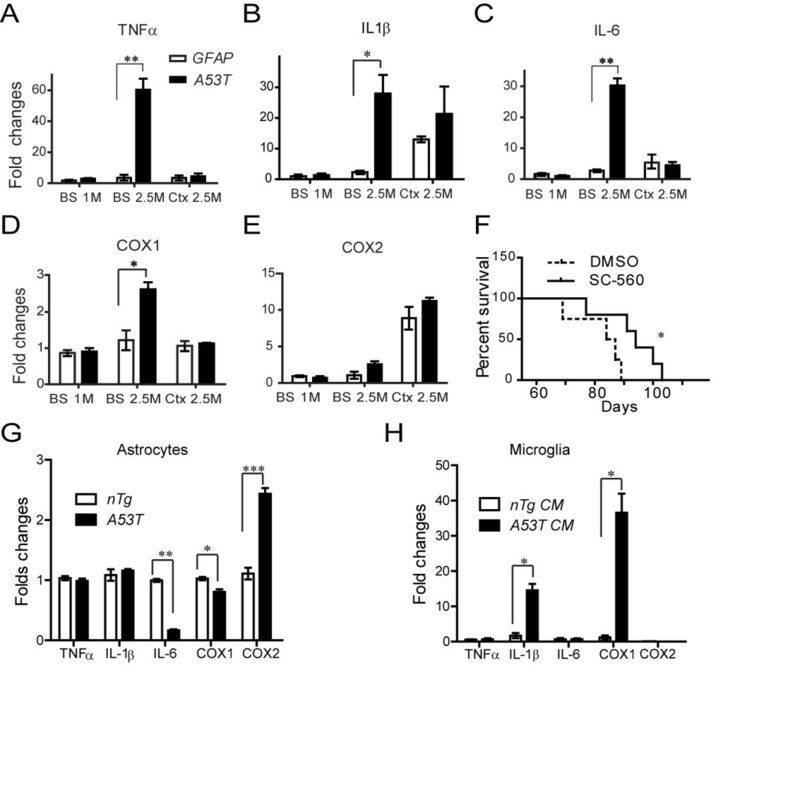 Together these data indicate that astrocytic expression A53T α-syn may cause damage to BBB. In support of this notion, focal deposition of immunoglobulin (Ig) G was observed in the brainstem of A53T symptomatic mice (Fig. 4L). Moreover, Prussian blue staining from symptomatic mice identified deposits of hemosiderin, a hemoglobin derivative, in the brainstem (Fig. 4N), suggesting the occurrence of microhemorrhage in these mice. Dysfunction of astrocytes in A53T mice. (A-F) Representative images show the co-staining of GFAP (C, D, green) and aquaporin 4 (A, B, red) in the brainstem of symptomatic A53T mice (B, D, F) and nTg littermates (A, C, E). Aquaporin 4 was redistributed into the cell body and proximal processes of astrocytes in the symptomatic A53T mice (B, D, F). Scale bar: 20 μm. (G-H) Representative images show glucose transporter 1 (Glut-1) staining in the epithelia cell of the symptomatic A53T mice (H) as well as age-matched nTg controls (G). The expression of Glut-1 was up-regulated in the A53T mice. Scale bar: 50 μm. (I-J) Double labeling of GFAP (green) and von Willebrand factor (vWF, red) in the brainstem of symptomatic A53T mice (J) and nTg littermates (I). The expression of vWF was elevated in A53T mice. Scale bar: 50 μm. (K-L) Representative images show double staining for IgG (green, arrowhead) and vWF (red) in the brainstem of symptomatic A53T mice (L) but not in the nTg littermate controls (K). Scale bar: 50 μm. (M-N) Representative images show the Prussian blue staining (nuclei were counterstained with fast red) in the brain stem of symptomatic A53T (N) and control mice (M). Scale bar: 20 μm. (O) Western blot analysis of the expression levels of excitatory amino acid transporter 1 and 2 (GLAST and GLT1) in the brainstem of A53T and control nTg mice. (P) Bar graph compares the levels of GLT1 and GLAST proteins in nTg, asymptomatic (A53T 1M) and symptomatic A53T mice (n = 3 per genotype). *p < 0.05, **p < 0.01. Astrocytes also express excitatory amino acid transporters, which are responsible for the majority of glutamate uptake in the brain and its dysfunction has been associated with multiple psychiatric and neurological disorders . Here we found that the expression of excitatory amino acid transporter 1 and 2 (GLAST, GLT1) was significantly decreased in asymptomatic and symptomatic A53T mice (Figs. 4O-P), indicating that excitotoxicity may occur in A53T mice. Astrocytes are active players in cerebral innate immunity . To investigate whether reactive astrocyte in symptomatic A53T mice triggered inflammatory response, we examined whether microglia, the immune defense cell in the CNS, were activated. Progressive activation of microglia was observed in the brain of A53T mice (Figs. 5A-C) as evidenced by enlarged soma and by the appearance of microglia clusters (Figs. 5A-C). Clusters of activated microglia with large, amoeboid shape and fewer branches were spotted firstly in the peduncle of cerebellum at asymptomatic stage, and later in the brainstem (Figs. 5B and 5D-E) and midbrain (Figs. 5C and 5D-E) at symptomatic stage. Although astrocytosis was observed in the forebrain regions (Fig. 3), interestingly, no obvious activation of microglia was observed in the cortical areas (Figs. 5A and 5D-E). Consistent with the morphology change of the microglia, the expression of Iba1 was dramatically up-regulated in the A53T mice as evidenced by quantitative RT-PCR and western blot analysis (see Additional file 7). More interestingly, clusters of activated microglia were found adjacent to spinal motor neurons and dopaminergic neurons in substantial nigra pars compacta (SNpc) (see Additional file 8). These data indicate that activated microglia may attack neurons in the spinal cord and SNpc and lead to neurodegeneration. Activation of microglia in A53T mice. (A-C) Representative images show Iba1 staining in cortex (Ctx), brainstem (BS) and substance nigra pars compacta (SNc) sections derived from A53T and nTg littermate control mice. Scale bars: 50 μm (A), 200 μm (B-C). (D-E), Quantitative measurement of the microglia (Iba1 positive cells) and microglia clusters in the cortex, substantia nigra pars compacta and brainstem (n = 3 per genotype). **p < 0.01, ***p < 0.001, compared with nTg; ##p < 0.01, compared with cortex. To examine whether neuronal loss occurred in the brain of symptomatic A53T mice, unbiased stereological analysis was employed to estimate the remained neurons in the cortex, striatum, SNpc, and spinal cord. While the numbers of tyrosine hydroxylase (TH)-positive dopaminergic neurons in SNpc and ventral tegmental area (VTA) were not altered in the A53T mice at 1 month of age (see Additional file 9), they were decreased by 60.5% in SNpc and by 26.1% in VTA of symptomatic A53T mice as compared with age-matched nTg littermates (Figs. 6A, C). Similarly, the numbers of motor neurons were significantly reduced in both cervical and lumber spinal cord of symptomatic A53T mice compared to control mice (Figs. 6B, D). In contrast, the number of neurons in the cerebral cortex and striatum area symptomatic A53T mice remained unchanged (see Additional file 9). Taken together, significant neuronal loss was detected in the midbrain and spinal cord of A53T symptomatic mice, which may underlie the movement disability developed in these animals. In addition, the close correlation of regional distribution between the occurrence of neurodegeneration and microglial activation indicate that activated microglia may play an important role in triggering the loss of neuron. Neuron loss occurred in the midbrain and the spinal cord of symptomatic A53T mice. (A) Representative images show TH and NeuN double staining in the SNpc area of symptomatic A53T mice and age-matched nTg littermates. Scale bars: 100 μm. (B) Representative images show NeuN staining in the ventral horn of lumbar spinal cord of symptomatic A53T mice and age-matched nTg littermates. Scale bar: 100 μm. (C) Bar graph depicts the numbers of TH-positive dopaminergic neurons in the SNpc and ventral tegmental area (VTA) of symptomatic A53T mice and nTg littermates (n = 3) estimated by unbiased stereological methods. *p < 0.05, **p < 0.01. (D) Bar graph reveals the numbers of motor neurons remained in the cervical and lumbar spinal cord of the symptomatic A53T mice and age-matched nTg littermates (n = 3). *p < 0.05. Increasing studies demonstrate the involvement of inflammation in the degeneration of neurons . Since inflammation is often in accompany with increased expression of cytokines, such as tumor necrosis factor-α (TNF-α), interleukin-1β (IL-1β), and interleukin-6 (IL-6), we quantified the expression of TNF-α, IL-1β, and IL-6 in the cortex and brainstem of A53T mice at both presymptomatic and symptomatic stages. At the presymptomatic stage when little activated microglia were observed, there was no significant alteration of TNF-α, IL-1β, and IL-6 expression in the cerebral cortex and brainstem of A53T mice (Figs. 7A-C). By contrast, at the symptomatic stage, a dramatic increase of TNF-α, IL-1β, and IL-6 expression was observed in the brainstem but not in the cerebral cortex of A53T mice (Figs. 7A-C), which is closely correlated with the presence of activated microglia (Figure 5). These results indicate that the increase production of cytokines is mainly from activated microglia. Consistently, the expression level of cyclooxygenase-1 (COX-1), which expression is restricted to microglia, was also up-regulated in the brainstem of symptomatic A53T mice; while the expression level of neuron-enriched COX-2 was not affected (Figs. 7D-E). Increase of inflammatory response in A53T mice. (A-E), Quantitative PCR array analysis of the expression of cytokines in the tissues of the brainstem (BS) and cerebral cortex (Ctx) of A53T mice at asymptomatic (1 M) and symptomatic (2.5) stages (n = 3 per genotype and per stage). *p < 0.05, **p < 0.01. (F), Survival curve shows the lifespan of A53T mice treated with COX-1 inhibitor, SC-560 (n = 5) or 40% vehicle, DMSO (n = 4). Log-rank test, *p < 0.05. (G), Quantitative PCR array analysis of the expression of cytokines in cultured astrocytes from the brainstem of A53T or nTg mice (n = 3 per genotype). *p < 0.05, **p < 0.01, ***p < 0.001. (H), Quantitative PCR array analysis of the expression of cytokines in the cultured primary microglia treated with conditioned medium from cultured astrocytes of the brainstem of A53T or nTg mice (n = 3 per genotype). *p < 0.05. To further demonstrate the origin of cytokines from activated microglia, we compared the expression of TNF-α, IL-1β, and IL-6 in primary cultured astrocytes from the brainstem of symptomatic A53T mice and age-matched littermate controls. No significant increase of TNF-α, IL-1β, and IL-6 expression was observed in cultured astrocytes from A53T mouse brainstem compared to control cultures (Fig. 7G), indicating a limited contribution of astrocytes in the direct production of cytokines. In contrast, the expression level of IL-1β and COX-1 was significantly up-regulated in cultured microglia treated with conditioned medium derived from cultured astrocytes of A53T mouse brainstem (Fig. 7H). These results indicate that substances released from A53T α-syn-expressing astrocytes may induce the production of proinflammatory cytokines from microglia. COX-1 is the key and rate-limiting enzyme in conversion of arachidonic acid to prostaglandins (PGs) and plays an important role in the neuroinflammatory process . To evaluate the contribution of COX-1 activity in the progression of paralysis in A53T mice, we treated presymptomatic 2-month old A53T mice with SC-560 (30 mg/kg, i.p. ), a selective inhibitor of COX-1  once a day for 7 days. Compared to that of vehicle-treated mice, the lifespan of SC-560-treated A53T mice was significantly extended (Fig. 7F, p = 0.035), suggesting that microglia-mediated inflammatory responses directly contribute to the neurodegeneration in A53T mice. The aggregated or truncated forms of α-syn has been indicated in initiating the downstream pathogenic events of neurodegeneration . We decided to examine the correlation between each form of α-syn and the progression of paralysis in A53T mice. We first checked the presence of α-syn aggregates in the brain, which appeared as α-syn-positive high molecular weight bands in Western blot analysis and resistant to Triton-X100 (TX) extraction in tissue fractionation studies. 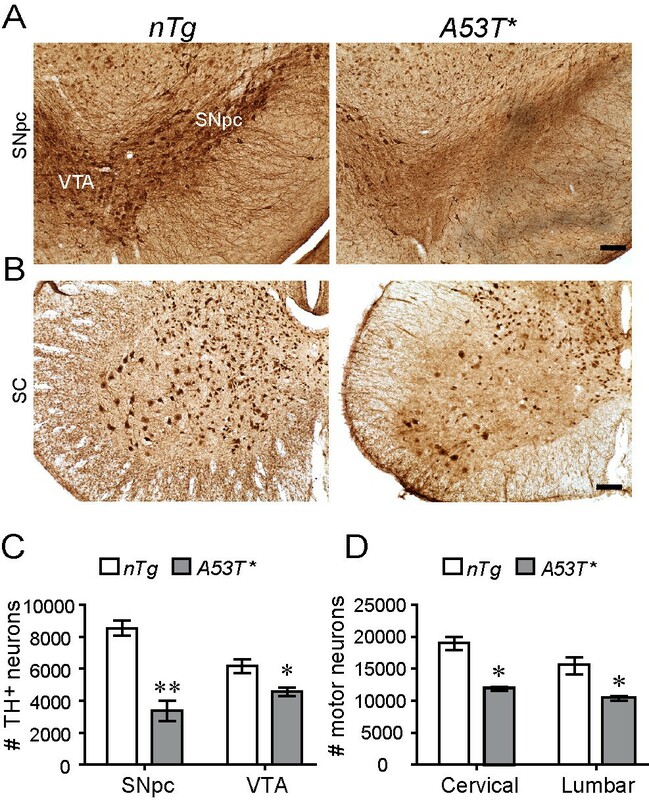 The aggregation of α-syn was significantly increased in the brain of symptomatic A53T mice compared with nTg controls and asymptomatic mice (Fig. 8A). Moreover, in agreement with the above neuropathological studies, the ratios of TX-insoluble α-syn were significantly higher in the brainstem as compared to the cerebral cortex of A53T mice (Figs. 8B-E). A similar phenomenon was also observed for truncated form of α-syn, which was selectively up-regulated in the brainstem of symptomatic A53T mice (Figs. 8F-G). Taken together, these data suggest that the aggregated and truncated forms of α-syn may impair the normal function of astrocytes and initiate the downstream pathogenic cascades leading to the loss of neurons in A53T mice. Increased accumulation of aggregated and truncated α-synuclein in A53T mice. (A) Western blot analysis shows high molecular weight (HMW) α-syn-positive bands in brainstem homogenates of A53T mice as compared to nTg controls. β-actin serves as loading control. (B-C) Western blot analysis shows the presence of HMW α-syn was more abundant in the brainstem than the cerebral cortex of A53T mice at different time points (B). Bar graph shows the ratio of HMW-α-syn/monomeric (Mono)-α-syn in the cortex (Ctx) and brainstem (BS) of A53T mice during the progression of paralysis (C). ***p < 0.0001. (D-E) Western blot analysis shows the level of α-syn in sequentially detergent-extracted cerebral cortex and brainstem homogenates of nTg and A53T mice (D). Bar graph reveals the ratio of total, TX-soluble, and TX-insoluble α-syn in the Ctx and BS of symptomatic A53T mice (E). Signal intensities of α-syn were normalized by β-actin. *p < 0.05. (F-G) Western bolt analysis shows the level of C-terminal truncated α-syn (pointed by arrows) using an antibody that specifically recognizes N-terminal 1-100 amino acids of α-syn (F). Bar graph depicts the ratio of truncated α-syn against total α-syn in the Ctx and BS of symptomatic A53T mice (G). *p < 0.05. Although α-syn is less abundant in glial cells , α-syn-containing inclusion bodies are present in astrocytes of postmortem PD brains [17–19]. By using a "tet-off" inducible transgenic approach, we selectively expressed PD-related A53T α-syn in astrocytes to investigate the pathological consequence of astrocytic expression and aggregation of α-syn in vivo. We show here that the presence of excess A53T α-syn in astrocyte caused severe astrogliosis, which disrupted the normal function of astrocytes critical for maintaining the integrity of blood-brain barrier and homeostasis of extracellular glutamate. The A53T α-syn induced astrogliosis also led to inflammation and microglial activation, particularly in the midbrain, brainstem and spinal cord. We further revealed a significant loss of dopaminergic neurons in the midbrain and motor neurons in the spinal cord of symptomatic mice, which may underlie the paralysis phenotypes developed by these mutant mice. In addition, COX-1-mediated inflammatory pathways may contribute to the neurodegeneration as evidenced by the beneficial effect of COX-1 inhibitor in extending the lifespan of A53T mice. Finally, the more severe pathological abnormalities shown in the brainstem of A53T mice were correlated with the more abundant accumulation of aggregated as well as truncated forms of α-syn in this region. Together, our findings demonstrate that astrocytic expression of PD-related A53T α-synuclein causes non-cell autonomous killing of neurons implicated in PD and motor neuron diseases, suggesting that reactive astrocytes may serve as a potential therapeutic target for treatment of these movement disorders. It is rather surprising to find that over-expression of A53T α-syn in astrocytes induced more robust loss of midbrain dopaminergic neuron than other published A53T α-syn transgenic mice in which the expression of mutant α-syn is under the control of neuronal promoters [10, 12, 37, 38]. Astrocytes may have to keep a lower level expression of α-syn for their normal functions. Therefore, over-expression of α-syn in astrocytes may cause more severe phenotypes compared to that in neurons. 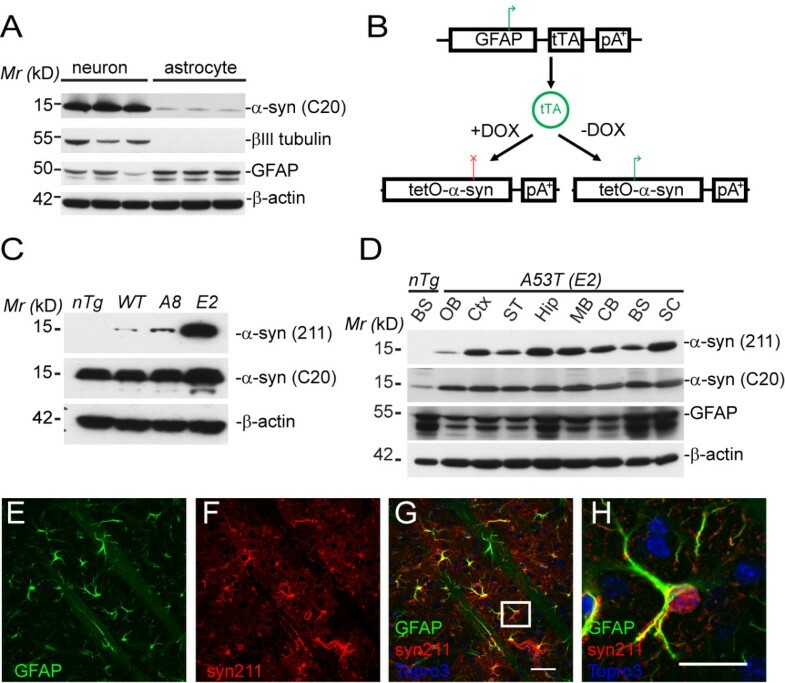 It is also possible that astrocyte is less able to detoxify the excess α-syn because of its lower level of cathepsin D which is recently proved to effectively degrade α-syn[39–41]. To address the importance of expression level of exogenous A53T α-syn in astrocytes in determining the onset of behavioral and neuropathological phenotypes in A53T mice, we also examined the behavioral and neuropathological phenotypes of A53T-A8 mice (the low expression line). Compared to the early onset paralysis exhibited in A53T-E2 mice (the high expression line), no obvious behavior abnormalities were observed in A53T-A8 mice up to 12 months of age (data now shown). However, astrogliosis and modest microglial activation were detected in the brainstem and SNpc area of A53T-A8 mice at 12 months of age (see Additional file 10). The milder phenotypes of A53T-A8 mice clearly indicate that the expression level of exogenous α-syn determines the onset and severity of observed behavioral and pathological abnormalities in these mutant mice. This observation is also consistent with the earlier genetic studies that multiplications of α-syn gene in patients cause early-onset familial PD [3, 4]. Astrocytic expression of A53T α-syn appears to affect multiple functions of astrocytes, resulting in decreased glutamate transporter expression, and disruption of brain-blood barrier. Astrogliosis happened throughout the brain and spinal cord at both asymptomatic and symptomatic stages. However, the activation of microglia was relatively confined to the midbrain, brainstem and spinal cord of symptomatic mice. It remains to determine why microglia responds differently to the dysfunction of astrocytes in different regions of the brain. Alternatively, under the stress of excess A53T α-syn, astrocytes may react differently in the brainstem compared to the cerebral cortex. In line with this notion, more aggregated and truncated forms of α-syn were detected in the brainstem than in the cortex. Astrocytes in the brainstem are perhaps less capable to remove the toxic α-syn species from the cells and are thereby more vulnerable to α-syn-mediated cytotoxicity, which may generate greater damage to surrounding cells, including enhanced activation of microglia and loss of neurons. The degeneration of midbrain dopaminergic neurons and spinal motor neurons may account for the paralysis of symptomatic A53T mice. Although the precise molecular mechanism of this rather selective loss of dopaminergic and motor neurons remains to be elucidated, it is possible that the survival of these neurons is more dependent on the normal function of astrocytes than other types of neurons. For instance, both midbrain dopaminergic neurons and motor neurons are preferentially vulnerable to the dysfunction of glutamate transporters , which were also down-regulated in our A53T mice. Interestingly, microglial activation was mainly detected in regions where neurodegeneration happened in A53T mice. The activated microglia is known to promote neurodegeneration by producing proinflammatory or potentially neurotoxic effectors, including IL-1β, NO, or reactive oxygen species (ROS) [43–45]. Microglia presents the most highest density in SNpc . Thus the loss of SNpc dopaminergic neurons in A53T mice may attribute to the activation of nearby microglia. 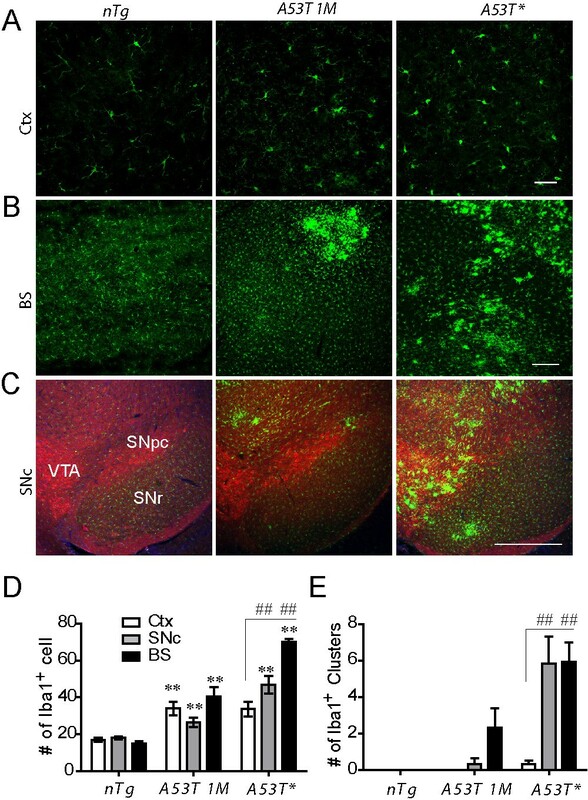 This hypothesis is in line with recent reports that lipopolysaccharide, an activator of microglia, causes SNpc dopaminergic neuron degeneration in vivo[47–49]. Nonetheless, it will be interesting to determine which factor is more important in the degeneration of dopaminergic neurons in A53T mice. Our studies from this new line of A53T α-syn transgenic mice not only provide strong evidences for the critical involvement of astrocytes in the pathogenesis of PD and motor neuron diseases, but also provide a very useful in vivo system to test novel therapeutics for preventing the loss of dopaminergic and motor neurons. To generate human A53T α-synuclein (α-syn) inducible transgenic mice, a DNA fragment containing human wild-type (WT) or A53T α-syn coding sequence was inserted into a tetracycline operator-regulated gene expression vector (tet-O) to generate the WT or A53T inducible expression construct. The insert was then purified and microinjected into fertilized oocytes derived from C57BL6/J mice. One WT and two A53T founders were obtained, which were used to cross with GFAP-tTA mice  to generate GFAP-tTA/tetO-α-syn double transgenic mice. The mice were housed in a pathogen-free climate-controlled facility with ad libitum access to regular diet and water. Genotypes were determined by PCR analysis of tail DNA extracted by DirectPCR Reagents (VIAGEN Biotech, CA). PCR primers for genotyping GFAP-tTA mice are: tTA-F (5'CCCTTGGAATTGACGAGTAC GGTG3') and MP1R (5'TGGTGTATGAGCGGCGGCGACGGCAG3'); and for genotyping tetO-α-syn mice are: PrpEx2-F (5'TACTGCTCCATTTTGCGTGA3') and SNCA-R (5'TCCAGAATTCCTTCCTGTGG3'). All mouse work follows the guidelines approved by the Institutional Animal Care and Use Committees of the National Institute of Child Health and Human Development. Rotarod test: as described previously , mice were placed onto a rotating rod with auto acceleration from 0 rpm to 40 rpm in 2 min (San Diego Instruments, San Diego, CA). The length of time the mouse stayed on the rotating rod was recorded. Open-field test: as described previously , the ambulatory, fine and rearing activities of mice were measured by the Flex-Field activity system (San Diego Instruments, CA). Flex-Field software was used to trace and quantify mouse movement in the unit as the number of beam breaks per 30 min. Grip strength measurement: as described previously , mice were allowed to use their forepaws or hind paws to pull or compress a triangular bar attached to a digital force gauge (Ametek, Largo, FL) set up to record the maximal pulling or compressing force. Five measurements were taken for each animal during each test. As described previously , mice were perfused via cardiac infusion with 4% paraformaldehyde in cold PBS. To obtain frozen sections, brain and spinal cord tissues were removed and submerged in 30% sucrose for 24 h and sectioned at 40 μm thickness with cryostat (Leica CM1950). For paraffin sections, sections at 8 μm thickness were obtained according to standard procedure. Antibodies specific to glial fibrillary acidic protein (GFAP) (1:1000, Sigma-Aldrich USA, St. Louis, MO), ionized calcium binding adaptor molecule-1 (Iba1, 1:1000, Wako Chemicals USA, Richmond, VA), tyrosine hydroxylase (TH, 1:1000, Pel-Freez Biologicals, Rogers, AR), α-synuclein (C20 &211, 1:1000, Santa Cruz Biotech, Santa Cruz, CA), Aquaporin 4 (1:500, Chemicon International, Inc USA, CA), glucose transporter 1 (1:500, Chemicon), von Willebrand Factor (1:500, Dako USA, Carpinteria, CA), iNOS (1:500, Sgima), SMI32 (Sternberger Monoclonal, Lutherville, MD), NeuN (1:1000, Chemicon) were used as suggested by manufacturers. Alexa 488 or Alex 568-conjugated secondary antibody (1:1000, Invitrogen) was used to visualize the staining, and Topro3 (1:1000, Invitrogen) was used for counterstaining the nuclei. Fluorescence images were captured using a laser scanning confocal microscope (LSM 510; Zeiss, Thornwood, NJ). The Images of 100 × objective (bar = 20 μM) were presented as a single optic layer after acquired in z-series stack scans at 0.8 μM intervals from individual field. The numbers of microglia and microglia cluster in the images taken from 25 × objective (368 μm × 368 μm) were counted. According to stereotaxic coordinates of mouse brains (3rd edition, Keith B.J. Franklin and George Paxinos), a series of coronal sections across the striatum (9 sections by every 10th section, Bregma -2.06-1.54 mm), SNpc (7 sections by every 4th section, Bregma -2.70- -3.82 mm), as well as cervical (approximate T1-T6) and lumbar spinal cord (approximate L1-L5, 10 sections by every 12th section) were stained with NeuN plus TH and NeuN, respectively, and visualized using the Vectastain ABC kit (Vector Laboratories, Burlingame, CA). The number of NeuN or TH-positive cells was assessed using Stereo Investigator 8, an unbiased stereological procedure with an optical fractionator (MicroBrightField Inc, Williston, VT). The sampling scheme was designed to have coefficient of error (CE) less than 10% in order to get reliable results. All stereological analyses were performed under the 100 × objective of a Zeiss Axio microscope (Imager A1). Primary cortical neuron cultures were conducted as described previously  by using postnatal day 1 pups. For cortical astrocyte and microglia cultures , the dispersed cells were collected by centrifugation and plated on 75 cm2 flasks in DMEM supplemented with 10% fetal bovine serum (FBS). The cells were pre-incubated at 37°C in a humidified atmosphere of air/5% CO2 and the medium was changed first 24 h later and on alternate 3-days thereafter. After a pre-culture period of 8-11 days the cellular debris, microglia were lifted from astrocytes layer by shaking the culture flasks at 190 rpm for 3 h at 30°C. The cells attached to the flask were passed and grown in six-well plates for 3 days until harvest for astrocytes culture. The cells floating in the medium were collected by centrifuge and plated on 6-well plates in DMEM supplemented with 10% FBS for microglial culture. After 24 h incubation, the medium of microglial cultures was switched to conditioned medium from cultured astrocytes. As previously described (Xian et al., in press), brain tissues (cerebral cortex, brainstem) were weighed and homogenized with 10 volumes of sucrose buffer (0.32 M sucrose, 1 mM NaHCO3, 1 mM MgCl2, and 0.5 mM CaCl2, plus protease and phosphatase inhibitor cocktails). Lysates were centrifuged at 1, 000 g for 10 min to separate supernatant (S1) and pellet (P1). Protein concentrations in S1 were measured by BCA (Pierce Biotechnology, Rockford, IL). S1 contains total α-synuclein protein, representing the sucrose fraction. An aliquot of S1 was diluted in the same volume of Triton extraction buffer (2% Triton X-100, 20 mM HEPES, plus protease and phosphatase inhibitor cocktails), homogenized by sonication, and centrifuged at 20, 000 × g for 30 min to obtain the Triton X-100-soluble (TX-sol) supernatant (S2) and Triton X-100-insoluble (TX-insol) pellet (P2). P2 was washed 4 times by 1% Triton X-100 buffer and centrifuged at 20, 000 × g for 10 min. The pellet fraction was further extracted in 2% SDS buffer (2% SDS, 20 mM HEPES, plus protease and phosphatase inhibitor cocktails) by sonication and centrifuged at 20, 800 × g for 5 min. The supernatant (S3) were present as Triton X-100-insoluble (TX-insol) or SDS-soluble fraction. Proteins were size-fractioned by 4-12% NuPage BisTris-polyacrylamide gel electrophoresis (Invitrogen) using MOPS running buffer (Invitrogen), and transferred to polyvinylidene difluoride (PVDF) or Nitrocellulose membranes. Antibodies specific to human/mouse α-synuclein (SynC20 recognizing the C terminal of both human and mouse α-synuclein, 1:1000, Santa Cruz; Syn-1 recognizing both human and mouse α-synuclein encoding amino acids 1-100, 1:1000, BD Biosciences, San Diego)  and β-actin (1:5000, Sigma) as loading control were used in this study. Horseradish peroxidase conjugated secondary antibodies were from Jackson ImmunoResearch. Signals were visualized by enhanced chemiluminescence development (Pierce, Rockford, IL) and quantified by imageJ software (NIH). For COX-1 inhibitor treatment, mutant mice and control littermates at 2 months of age were administrated with SC-560 (30 mg/kg; Cayman Chemical, Ann Arbor, MI, USA) or vehicle (40% dimethyl sulfoxide in 0.1 M phosphate buffer, pH 7.4) through intraperitoneal (IP) injection once a day for 7 days . RNA was harvested using Qiagen RNeasy mini kit and converted into first-strand cDNA using RT2 First Strand Kit (SuperArray Bioscience Corporation). Quantitative real-time PCR was performed using an ABI Prism 7900HT Fast Detection System (Applied Biosystems). Statistical analysis was performed using the Graphpad Prism 5 (Graphpad Software Inc. La Jolla, CA). Data are presented as Means ± SEM. Statistical significances were determined by comparing means of different groups using t-test or ANOVA followed by Post Hoc Tukey HSD test, and presented as *p < 0.05, **p < 0.01, ***p < 0.001. This work was supported by the intramural research programs of National Institute on Aging at the National Institutes of Health (H.C., Z01-AG000959-05). We thank Dr. Xiao-Jiang Li for helpful suggestions. We thank the NIH Fellows Editorial Board for manuscript editing. XLG and HC designed the experiments and wrote the manuscript. XLG, CXL, CSX and LS performed the experiments. XL provided some materials. All authors have read and approved the final manuscript.